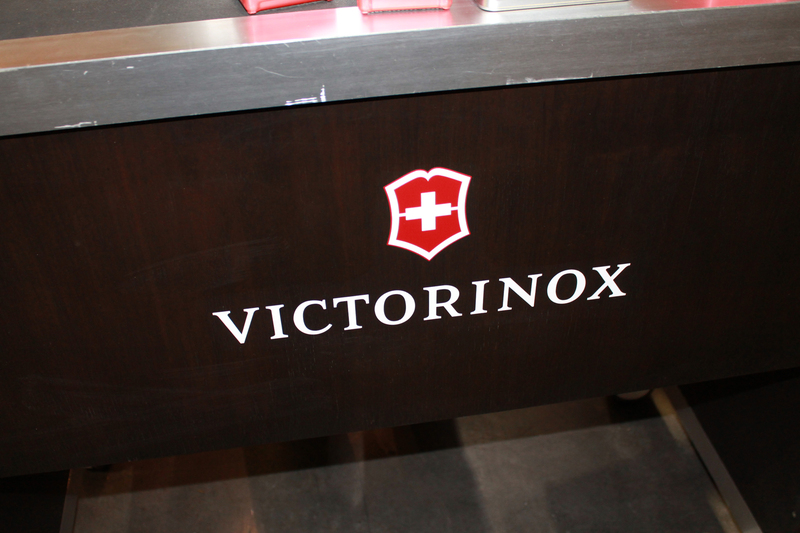 I had to stop at the Victorinox booth at SHOT Show 2014. 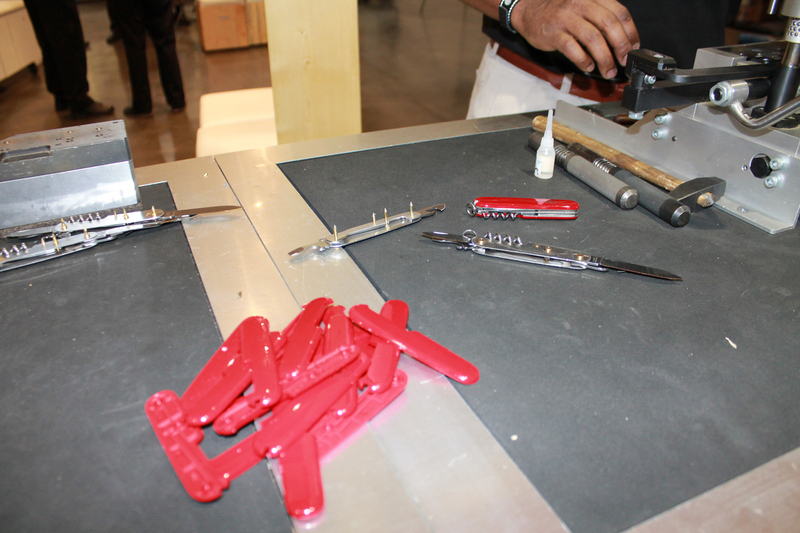 Dontrese Brown was assembling Victorinox Swiss Army Knives! 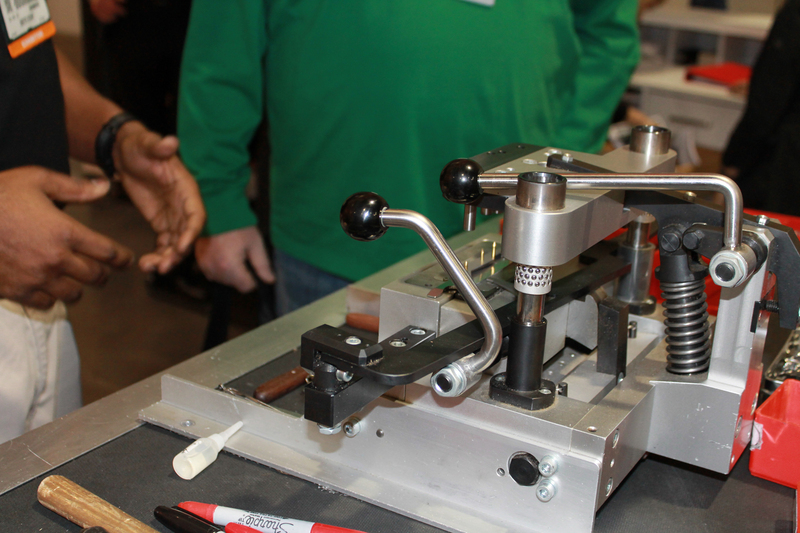 Integral to the construction of a knife is the special mechanical press that mates the component parts together. Only two of these special presses exist: one in Europe and one in the United States. 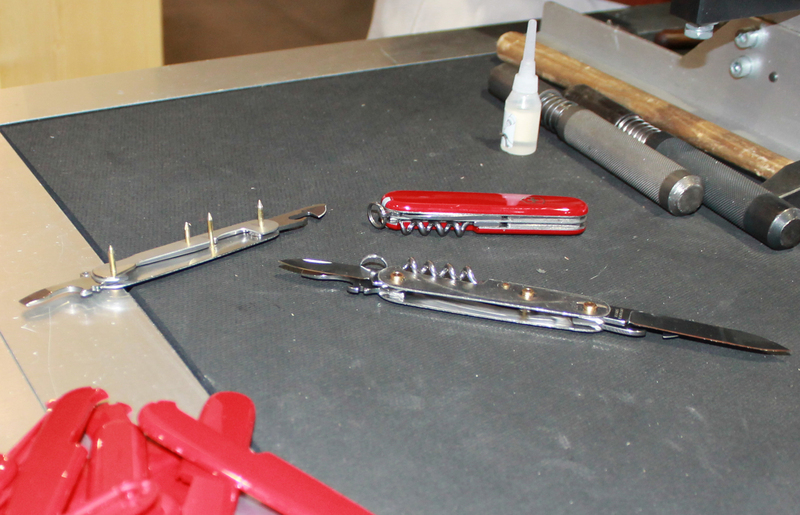 Both are for demonstrating how a Victorinox knife is built. 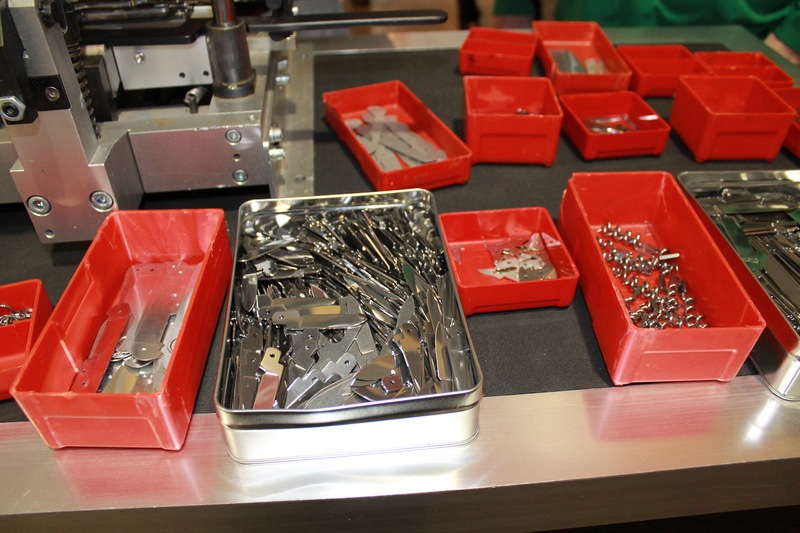 Obviously, production knives are made on large industrial machines. 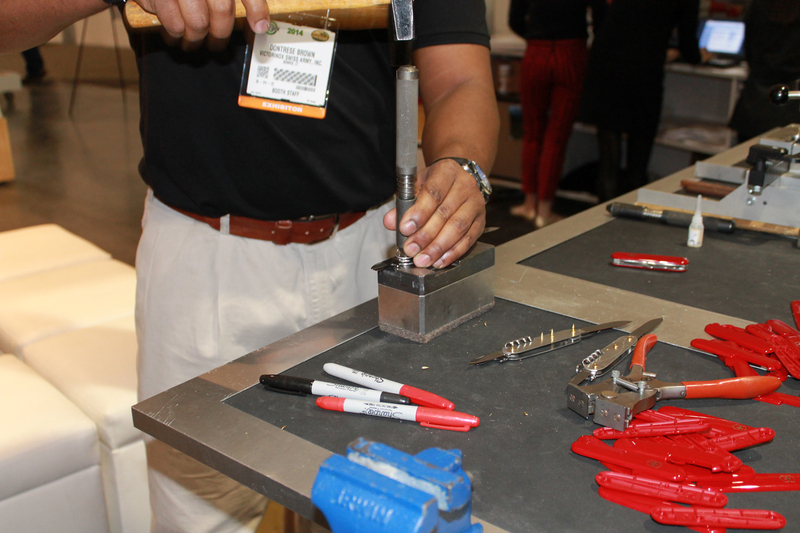 Brown, who is actually a creative director for the Victorinox company, said he began learning how to build the knives for events and shows about two years ago. 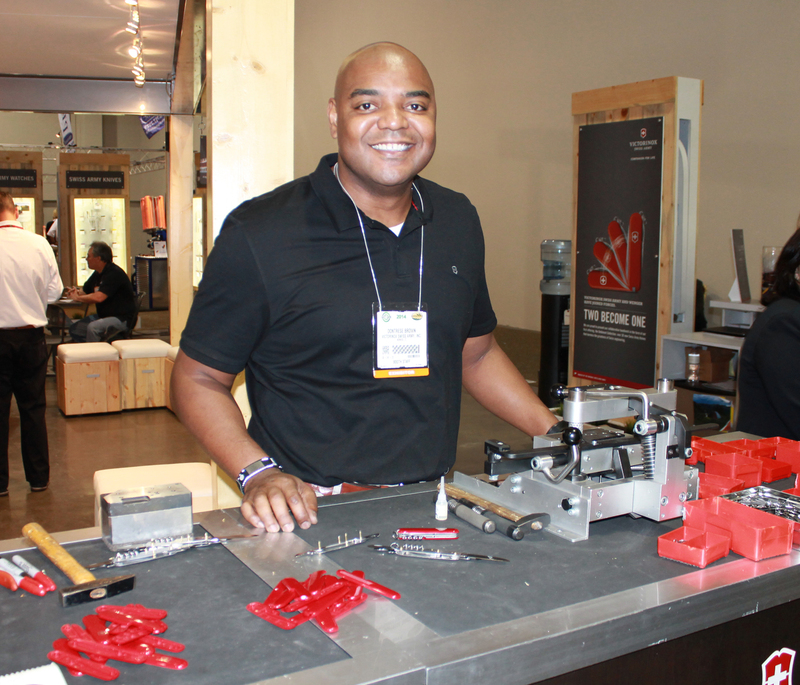 He told me he made nearly 500 knives before he was able to assemble one that he would actually give to someone. 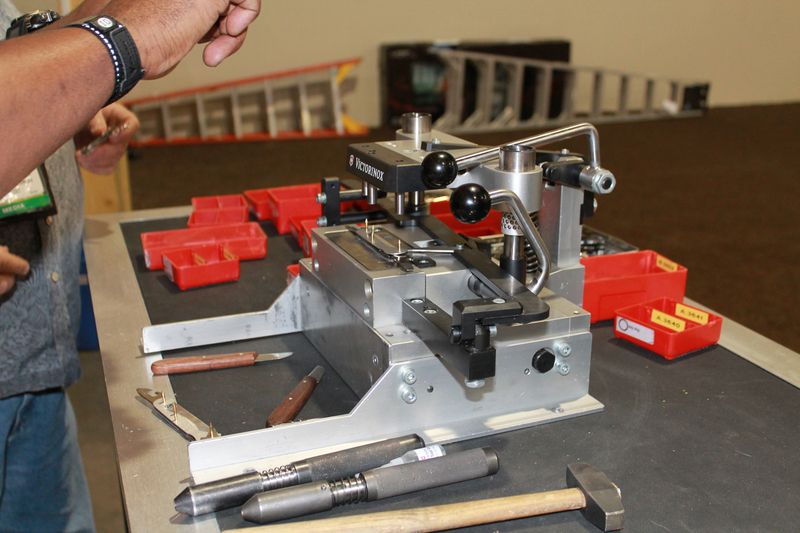 The process looks simple, but it takes some practice to ensure the parts are fitted properly. 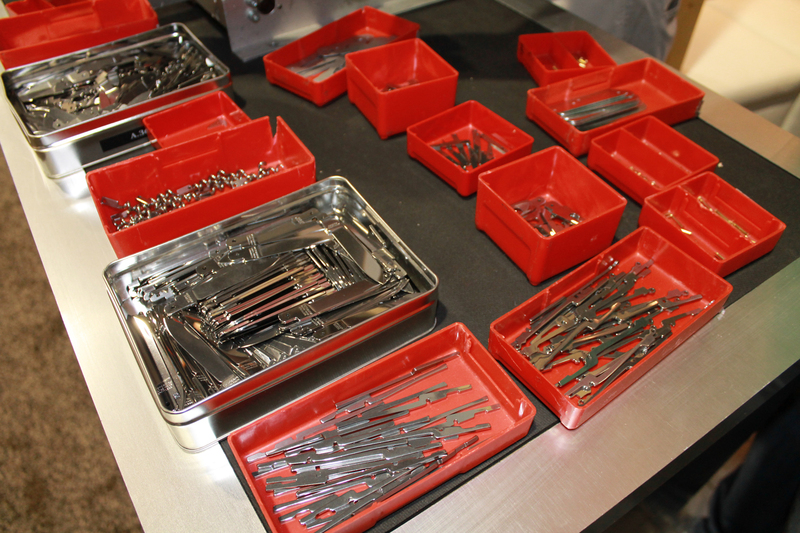 Key to the operation is the press where the knives are constructed from the bottom up by hand. 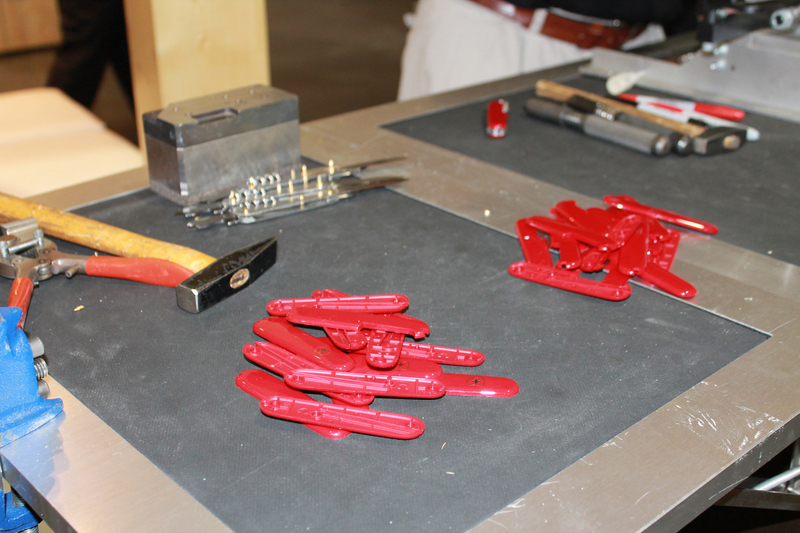 Brass pivots and pins are placed in the jig. 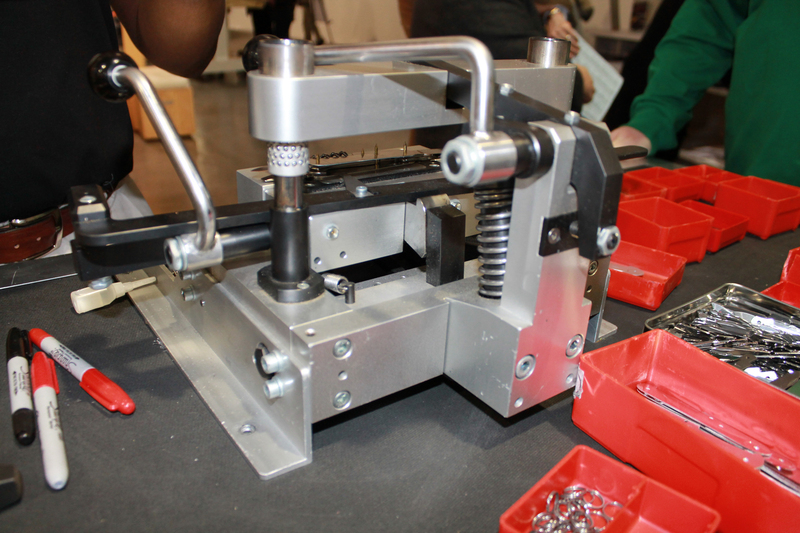 Components such as dividers, backsprings, and blades (to include corkscrews, scissors, punches, awls, pliers, and such) are layered into the jig and press fit together in steps. 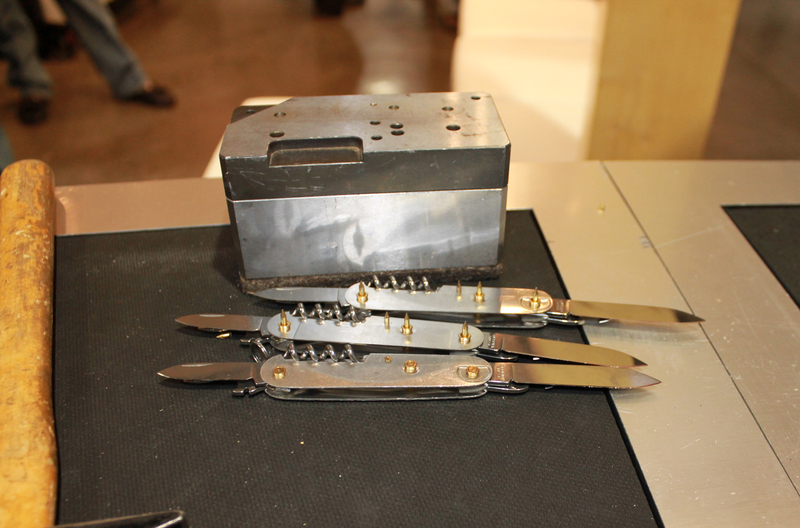 When the layers for the particular model of knife are completed, the brass pins and pivots are trimmed and capped. The caps are peened to secure them. Plastic handle scales fit over the end dividers and caps. 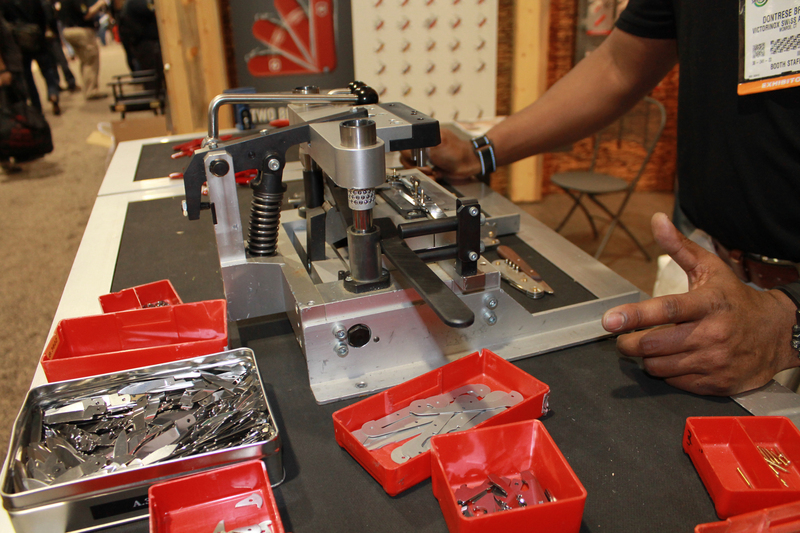 Brown used the pressure of a vise to mount the signature red handle scales to the knife. 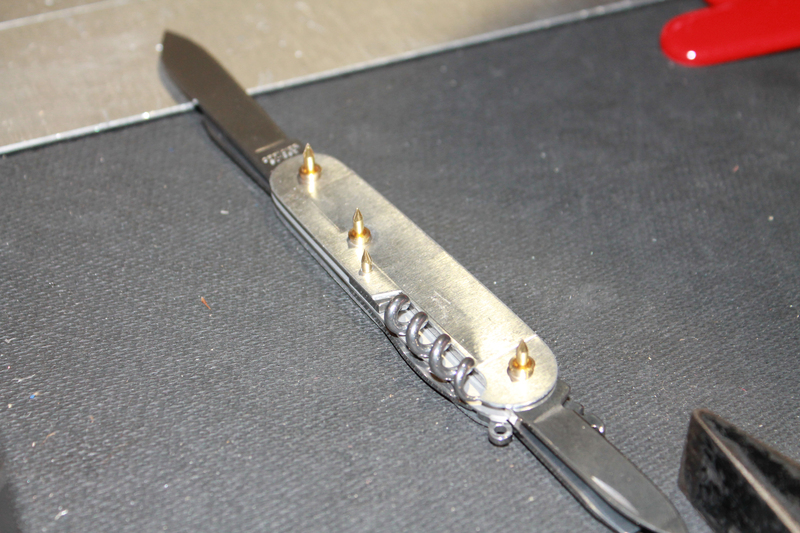 He inserted a toothpick and tweezers to finish the new Victorinox Swiss Army Knife. If you want to see the whole process, I included a video below that someone made at a show a few years ago. 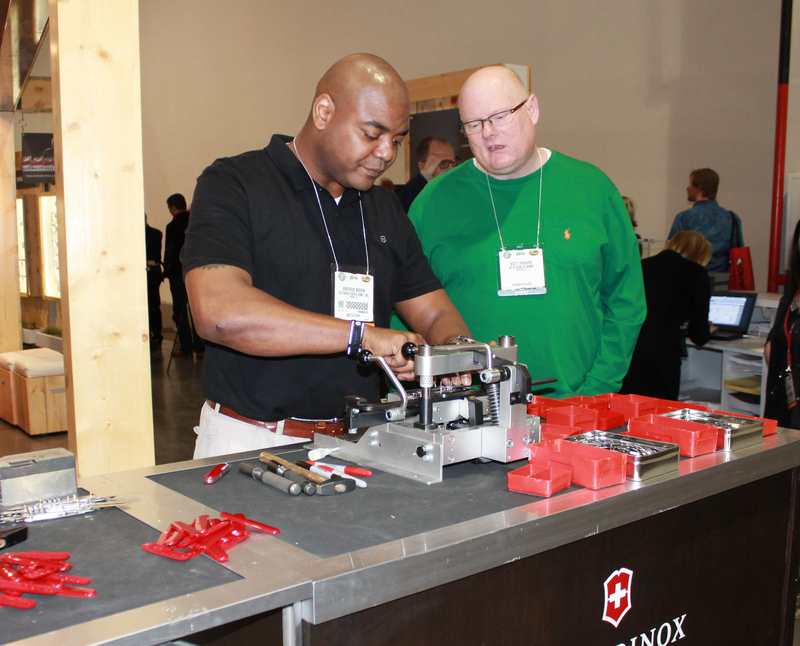 This entry was posted in Knives and tagged SHOT Show, Swiss Army Knife, Victorinox. Bookmark the permalink.